You Call This Change Senator Obama? Even though I am a registered Republican, I worked very diligently on Barack Obama's primary campaign here in Ohio and then crossed the border to volunteer during his three-week Pennsylvania primary effort. I considered myself to be someone who was committed to his election as president this fall. But after reading who is serving on his "new national security advisory group," I feel like I have been duped ("Obama Convenes Security Panel," June 19). With so many former, recycled Clinton advisers, I can't help but wonder if I supported the wrong candidate. Perhaps we should have stayed with the Clintons. Are there no new faces in this arena? Is this the best Mr. Obama can do? I understand that many voters credit the Clintons with a peaceful end to the last century, but I blame their lack of an appropriate response to any of the numerous terrorist attacks under their watch for the tragedy that befell us on 9/11. The problem I have is that although we will have a clear choice between two very different options this fall, both approaches have failed us as a nation. Where are the new ideas? Where is the change? Going back to the 1990s isn't change in my book. I have to reconsider my support of the Obama candidacy. I honestly believe we would be better off with John McCain's promise of a forceful response, over the nonresponse of the last administration. I am extremely disappointed. Labels: MSM, Stuff I Notice, why I wuzzadem, You Call This Change? I like to travel and do a fair amount for my work. But you never know what you will find when you get home. 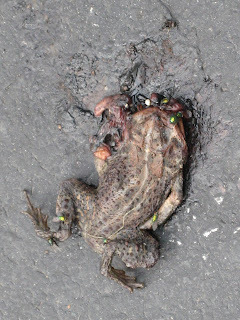 Here is a pic of a dead frog I found in my driveway when I got home from a trip to Pittsburgh for 2 days. There is a small creek at the front of my property and I can only guess this frog made his way up my driveway (about 250 feet from the creek) where he got smushed by my truck tire? Doc Rivers is 46 years old and is the coach for the Celtics. His father died last fall suddenly. The Boston Celtics, are winning Game 6 at halftime by 23 points. If they win the game, they win the NBA league title! Today is Doc's father's birthday. Life is funny huh? Congrats to Doc Rivers and his father who was a Chicago policeman and steered his son past life's many pitfalls and to success in the NBA and in life! Senator Obama has proposed eliminating the earnings ceiling on the social security tax. That means highly-paid pro athletes and their employers will get socked for millions more in social security taxes. For example, the New York Knicks had a player payroll of almost $90 Million this year. They will pay about 6% of that in added social security taxes if Obama becomes president and his plan is enacted. Therefore, the Knick team owners will pay $5.5 Million more and the Kmicks players will pay about $5.5 Million more. Under social security rules, the employer pays 6.2% of payroll and the employee pays another 6.2%. So an NBA team and its players with let's say $90 Million in player salaries will pay about $11 Million to Uncle Sam just to cover increased social security taxes under Senator's Obama plan. There are thirty NBA teams so this will cost the NBA about $330 Million per year or more than $3 Billion over ten years! The league has approximately 450 players. Senator Obama's plan will cost the average player (over ten years) $3.6 Million! This $11 Million figure will be even greater if we tally up the increased social security taxes for highly paid coaches, general managers, etc. Will Senator Obama's tax plan cause inflation? Can you say "higher ticket prices"? Answer: “There are times, to be perfectly honest, when I wish I had more of a life,” says Curry, 51, the wife of businessman Brian Ross and mother of teens McKenzie, 15, and Walker, 13. “But my family knows that my sense of mission requires me to say ‘yes’ whenever I can do something to save lives in places like Bosnia, Darfur, and Congo.” Curry has become such a superstar at NBC that you can expect to see her as part of the network’s election coverage this summer and fall. Damn - I never knew that folks like Curry and I presume Matt Lauer are out there saving lives! God Bless Our High Paid Talking Heads! Just call me fair and balanced. 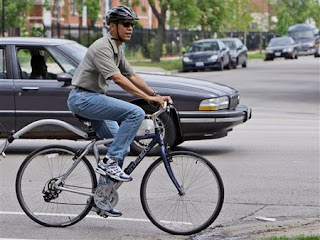 I posted one great pic of Obama and this one where he looks like a dweeb on a bike. The new owner (Philadelphia Media Holdings) of the Philadelphia Inquirer reportedly missed an interest payment on some subordinated debt. I have never witnessed a business allow its employees to deliberately sabotage the business and turn away customers. But I believe that is what the liberals who run these papers have done. The editorial staff and many reporters just don't get it so they continue to write far left-slanting news stories. Do they ever even wonder why the paper's circulation continues to drop? Sure, I know there are other reasons for the newspapers to lose customers. But the Philadelphia Daily News and The New York Times lost me as a customer some time ago. 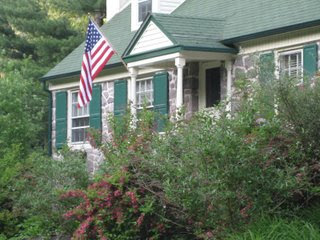 I was a semi-regular consumer of each paper but got sick and tired of the liberal slant. Letting the employees ruin a newspaper is like a restaurant employing a waiter or bartender who did not bathe or use deodorant. It is nuts! I predict the Associated Press will be next- its wire stories surely affect the slant of these local papers who pay big fees to the AP for its crappy stories. Evidence: have you ever read "news" stories from the AP's economic writer, Jeannine Aversa? If not, I suggest you do and you will see why I feel the way I do.